Images like these are the roots of today's "fried chicken" stereotypes. It's almost a cliche. First, someone talking about black people makes reference to fried chicken, watermelon, monkeys or dogs - or even uses the indefensible N-word. Then, along with the inevitable apology, comes the kicker: I'm not racist. 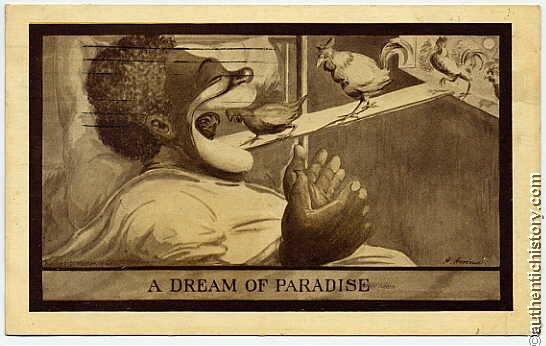 Perhaps the Spanish-born Garcia was unaware that chicken stereotypes have been used for at least a century to denigrate African-Americans. Maybe he was unaware of attitudes buried in his subconscious mind. As the backlash increased, Garcia did apologize further, calling his remark "totally stupid and out of place." "I think it's human nature that if you're a racist, you don't want to admit it," says conservative radio host Mike Gallagher. -Montana's chief federal judge resigned after emailing a joke in which a young Obama asks why he is black and his mother is white. The punch line involved a dog. "Although (the joke) is racist, I'm not that way, never have been," Judge Richard Cebull said. - After drawing national attention for selling an anti-Obama bumper sticker that said "Don't Re-Nig in 2012," creator Paula Smith of Hinesville, Georgia insisted that neither she nor the sticker were racist. She called the uproar "amazing and entertaining." - New York gubernatorial candidate Carl Paladino was pilloried for sending emails labeled "Obama Inauguration Rehearsal" that showed an African tribesman dancing. His response: "I'm not a racist. I'm proud to have created jobs for hundreds of people of every color and ethnicity." - Arizona radio host Barbara Espinosa said she "voted for the white guy" and called Obama a monkey. Asked if that was offensive, she replied, "I'm anything but racist." "People have narratives about themselves, self concepts, a whole host of attitudes that they want to think about themselves," said Routledge. "A lot of times they match well, but sometimes they don't." Other psychologists go further. They blame "implicit bias" - unconscious attitudes based on the way racial groups are commonly portrayed in the public space. Goff says it depends on the individual - but that the rush to brand people as racist obscures the bigger issue of the harm caused by their statements. "Let's have a conversation about why (Garcia) said it in the first place, and why these moments seem to come up so much," Goff said. "We should be able to say, 'You know what, that was one of those implicit bias moments.'" Some of his favorite examples: "I'm not racist but having a black president is just not smart," ''I'm not racist but black people scare me," and "I'm not racist but I can see where Hitler was coming from." "They think that unless they're actually lynching a black person or something, they're not racist," Smith said, "because they don't understand things like institutionalized racism or inferiorization, and the historical context of their statement." He then tells a story about walking into a restaurant, contemplating his order with the counterman, and "before I even finish my sentence he says, 'The chicken!'"